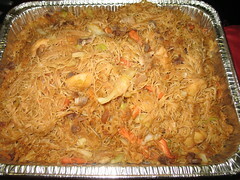 Pancit Bihon is one of the favorite recipe of Filipino and Chinese. This popular dish is also serve during different occasions such as party, wedding, fiesta, Christmas and Noche Buena. Saute garlic and onion in oil until fragrant. Stir in pork strips and cook until brown. Blend in shrimps and chicken meat. Add all the vegetables and stir fry just until done. Remove half of the mixture and set aside. Pour in stock and soy sauce. Let boil toss in noodles, season to taste and simmer just until noodles are tender. Transfer on to serving plate and top with the reserved meat-vegetable mixture.Serve with calamansi.